Municipal garbage trucks still blocking entrances to a refinery and four chemical plants in standoff over carcinogens. 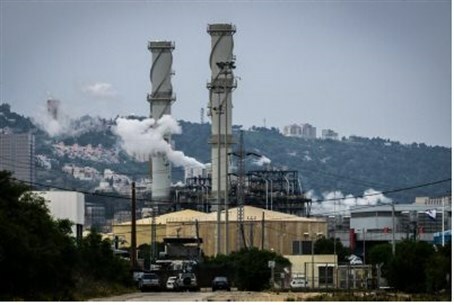 Municipal garbage trucks blocked the entrances to a refinery and four chemical plants in Israel's third city Haifa Monday following a scare over high cancer rates, a municipal spokesman said. The standoff began on Sunday morning when Haifa Mayor Yona Yahav ordered municipal garbage trucks to block access to the plants after warnings linking high cancer rates in the area to air pollution. "These trucks were sent once again on Monday morning to block access to four petrochemical plants and a refinery," Tzahi Terrano, a spokesman for Haifa city council, told AFP. "The owners tried to remove them but they did not manage to," he said. Media reports said several of the companies had tried to use cranes to remove the trucks. Yahav has conditioned a removal of the trucks on the government making a clear declaration of what level of risk was posed by the plants and to what extent the situation was "really catastrophic for public health," Terrano said. He said the plants could only be reopened by a court order. The standoff began after a senior health ministry official said last week that 16 percent of cancer cases in the Haifa Bay area could be attributed to air pollution. The observations were laid out in a letter to the interior ministry's planning department over a request to expand oil refineries in the area. "Out of 4,860 cases of cancer, an estimated 780 were cases of excess morbidity in the Haifa region as a result of exposure to air pollution," wrote Itamar Grotto, head of the ministry's public health services, with the letter leaked to the Israeli press. He also said that air pollution was responsible for half of the cancer cases in children aged 14 and under in the area. "For children aged 0-14, out of 60 cases of cancer, it may be estimated that approximately 30 cases were excess morbidity in the Haifa region as a result of air pollution," he wrote. The letter quoted extensively from a report compiled by researchers at Jerusalem's Hebrew University. Israel Oil Refineries, one of the nation's biggest petrochemical conglomerates and one of the five companies in question, released a statement saying it had invested over $255 million (236 million euros) in "preserving the environment and diminishing pollutant emissions." Haifa Chemicals, another of the companies, has lodged a legal complaint. The city, which has a population of 270,000, is home to Israel's largest port and there are a number of petrochemical plants located in and around the bay. Environmental groups have previously accused the mayor of having "closed his eyes" to the danger of pollution despite a series of reports warning of the harm to public health.